Ever since my days at Kate's Paperie, Miquelrius notebooks have been a constant favorite. I was lucky to find a local, small grocery store that actually carries them. But, in order to get the exact one I want, I usually have to order them online. I have never been a *daily planner* kind of person. I need less structure. I need open pages for my thoughts, calendar, lists, plans, and doodles to unfold naturally. 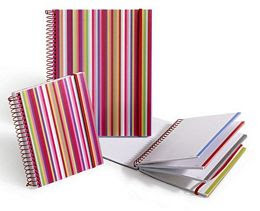 those notebooks quench all my desires.